My daughters and I know a thing or two about losing everything. Ten years ago, when I awoke from a relationship that was killing me, they also awoke from its grip with all of their life possessions gone. At the time, I was too numb and tired and overwhelmed to truly realize the impact of their loss but last night, as my youngest daughter and I sat and chatted over dinner at our favourite restaurant, we talked about those losses back then, and how they were affecting our state of being in the here and now. It’s not that there’s anger or resentment floating amidst her feelings today. But there is sadness, and there is the shared knowing of what it feels like to lose the things you hold so dear, the little, and the large, things that told the story of your life. For my youngest daughter, one of those things is an oversized stuffed polar bear she received one year from Santa. He went everywhere with her. Even airplanes. And in the debacle that was our lives back then, he got lost. And she thinks of him still today. As we sat and chatted over dinner, she shared how she felt helping strangers clear out their homes after the flood waters had receded. There was no time to carefully pick through the debris. It all had to be jettisoned. It all had to go. But for her, the memories of standing with her sister in a warehouse where all our belongings had been stored and were now to be auctioned off because the bill for their storage had never been paid were real and raw in the moment of helping another family in the disaster. At the time of their personal disaster I was far away. The man who had promised to love me and never hurt me and then proceeded to deceive, lie and manipulate had been arrested and was in jail and I was still on the coast, still too broken to return and too afraid. The possibility of his getting out on bail was real and my fear of what would happen if he did far too real as well. They knew I was alive. We had been in contact but they were still too angry and hurt and confused and lost for me to be of any help to them in my broken state. I had contacted the management of the warehouse where our belongings had been stored when everything had fallen apart and discovered that I owed thousands of dollars I did not have because the bill had never been paid. The woman who owned the storage company, Lynn, was very kind and offered to let my daughters come in to retrieve their personal belongings. And so one sunny day in June they arrived in the warehouse with their father to see our entire lives piled in a corner. Couches. Chairs. Tables. Rugs. Lamps. The antique armoires my youngest daughter believed was haunted by ‘Grace’ a woman who lived inside one of its secret drawers who liked to whisper stories of the things the armoires had once treasured in its confines. Boxes upon boxes piled with all our dishes and cups and pots and pans. With their father keeping watch and in their teenage minds, angry and impatient to get it over with, the girls quickly rifled through the boxes that were clearly marked “Alexis and Liseanne” and pulled out what they could. It must have been heart-breaking, terrifying and traumatizing. I know it was. Last night, as Liseanne and I spoke of those events and their link to now, I watched the sadness flit across her face and shared with her how those days have been stirring in me this past week too. And we chatted some more and the sadness eased and in the end, we both agreed, being alone in the city for her this weekend is not where she needs to be. C.C. and I are flying to Toronto tonight to go to his niece’s wedding. And then, we’re driving up to Barry’s Bay to spend the week at the cottage of our dear friends U & A. The trip was planned long before the waters flooded our city and I must admit, I am relieved to be going away. Liseanne is still evacuated, her return date to her apartment unknown. A sewer pipe burst after they’d pumped out the underground parkade of her building and currently the building is unfit for human habitation. The highway west into the mountains where she had planned to go camping with friends is down to one lane and traffic is a big, big issue. And so, in the midst of sharing a meal and our conversation we both agreed, going to see her sister in Vancouver is a good idea for the weekend. A quick phone call to Alexis, an airline search online using her phone, and she is now booked to fly out late this afternoon. Alexis and her boyfriend, J, are picking her up and whisking her to the yacht club where J’s mother and step dad will be waiting to sail them away for three days in the sun. I am relieved. Once upon a time my daughters lost everything that told the story of their young lives. We’ve healed and grown since those days, but this week, amidst the sadness of so many losses, we have all been awash in the sorrow of those days long ago. She’s volunteered all week. Helped out where ever she could and for the next few days, she needs to bask in the love of her sister, laugh and swim and lie about in the sun and let the gentle ocean breeze caress her skin and the lull of the boat ease her heartache. My daughters will be together this weekend sharing in the one thing that can never be lost. Their love for eachother. I am grateful. Categories: Uncategorized | Tags: Calgary flood 2013 | Permalink. I cried yesterday. I was driving down a road, listening to CBC and without any ceremony or warning, tears started flowing from my eyes. “Stop it!” the critter hissed. “Let me be,” my compassionate self replied. I knew I was out of balance. I pulled over and breathed and reminded myself, “Sadness is here. I am not alone.” And, unlike the flood damage in our city, my tears dried leaving me refreshed. Later, I was walking with two co-workers to grab a bite to eat when we passed a man who appeared to be in distress. I walked over to where he was leaning against a tree and asked him if we could help. “You don’t look like you’re feeling very well,” I said. And so, we walked to the bench and sat down. His name was Jeff. He’d been staying at the Drop-In when it was evacuated and rather than go up to the site of their emergency/emergency shelter, he chose to ‘sleep rough’. “I couldn’t take that chaos,” he said. “Have you had much to eat?” I asked him. He shook his head. “My stomach is too upset to eat,” he said. And he blamed it on the fish fillet burger he’d had the night before. “How about we get you a juice?” and Wendy my co-worker ran into the restaurant in front of which we were sitting to grab one. His hands shook as he brought the juice to his mouth. His eyes were rheumy. His shoulders slumped. We sat and chatted and eventually he agreed to try some food. Wendy bought him a sandwich and he took it with the promise to eat it, later. He refused to let us call for assistance and promised to sit on the bench until he felt well enough to walk again. We sat quietly for a few moments. I asked again if we could call for help. Again he refused. When we left him he was sitting in the afternoon sun, one of thousands of homeless in this city of flooded houses and streets and buildings. For Jeff, his homelessness will not end when the power is restored and the debris cleaned up. His homelessness will not be over when the garbage is carried out and homes are rebuilt. There is no rebuilding of his home. No clearing out of debris from his life. He sits. A lone man on a bench lost in the underbelly of homelessness. A silent figure searching for a way back home and fearing he’ll never find it. He has lost all hope. I cried yesterday morning and then again on my way home in the evening. I thought about Jeff and the hundreds of others who have no home to go back to. And I thought about the work we do at the Foundation where I work and what all the agencies do who are working so hard to get people back home to a place of their own. Like our Mayor who is working tirelessly to keep the people of our city safe and to instill hope that they will be able to go back home, the agencies providing housing first to homeless Calgarians keep hope and the dream of going home alive. Jeff and so many others, have lost all hope of going home. They know they have a place to stay every night. They know, thanks to shelters like the DI and Alpha House and The Mustard Seed and Inn from the Cold, they know they can find a meal, a caring hand, a welcoming place. What they don’t know is, how to get back home. What they don’t know is how to find their way to a place of their own. Emergency shelter is an important step in keeping people safe, but it is not home. No matter how hard we want to believe it is. It is not home. I met a man on the streets yesterday. He reminded me that no matter how lost we become, we must hold out hope and compassion and love and care for those who are struggling to find their way back home. Even when we cannot do anything more than give them a juice, a sandwich and a smile, we cannot give up hope that they will get back to the place where they belong — home. It is like this city. As people muck out their basements and survey the damage, we must hold onto hope, even in those moments when they are feeling the despair of all that they have lost. We must hold out, hold onto, and be held by hope, love and compassion. And in our holding onto hope, even when they feel lost, we restore the thing they want the most, the way back to a place to call their own. Today I returned to Sunnyside to help out. After working at one home where we got a basement cleaned up, I was called to a lunch line up at the Disaster Cafe, a streetside barbecue and food line up completely staffed by volunteers and survivors of the flood. I heard from a lady who sat next to me that there was a friend of hers who had a meltdown . So that was my next call, I was introduced and we just talked for a while. I did my Efit coaching right there on the spot and just listened and chatted. She was heartened to know just how much support was there. We then went downstairs and bit by bit, we got her to agree that she had to let go and just let us volunteers get her basement cleaned up. And then a troupe of people showed up from the Beltline Community. They haven’t been allowed into their homes, no power, so they were out helping. And by gosh, we got the job done. I am so thankful for the opportunity to be of service in a trying and difficult time. We are all blessed by this show of spirit and joy and determination. John is an example of thousands of volunteers who are deploying throughout our city to lend a hand and clean up. This morning he called to tell me how the synchronicity of those events were amazing. How just as he got the woman calmed down and willing to at least talk about removing everything without first searching through every single item, one by one in her basement, a fireman walked over and convinced her of the need to remove the drywall to avoid mold and then, the people from the Beltline stepped in and got it all done. Calgary and Calgarians in action. A city worker explained to me that this was by far a life changing event for him. He had originally gone out to examine industrial complexes and the like, but soon found himself having to examine the residential homes of Sunnyside. ”It humanized the whole event for me. I got to see a face with each home as a homeowner would struggle to pump out his basement, trying to save his life’s belongings, but not realizing that the water had no place to go and would invariably end up in someone else’s basement.” He states that he sees the whole event now with a different perspective, and tries to offer some compassion whenever speaking with the unfortunately devastated homeowners. He was especially touched by the sudden arrival the other day of a family, who drove up, set up a BBQ and table, and immediately started serving hot food to the locals and emergency workers. When asked if they were residents, he replies that they were not, and had come in from another part of town randomly to simply do their part to feed the people who need it most. He ended the story with the simple remark, “People are awesome.” Read the whole article HERE. I spoke with a police officer yesterday. He’d forgotten a meeting we’d scheduled and phoned to apologize. Seriously? Like he needed to? Calgary Police Service members have been tireless, absolutely tireless in their efforts to serve and protect. They have worked 20 hour shifts, come back from holidays to be on duty, and when not on duty, volunteered where ever possible. Along with Fire, EMS, and other emergency responders and city staff, they have lifted our city up and kept us from drowning beneath the weight of this disaster. And then, there’s our Mayor Naheed Nenshi. Few words can describe the pride of every Calgarian in how our mayor has dealt with this entire crisis with compassion, humility, decisiveness and… humour. It is his humour, and his openness and candor that has inspired every Calgarian to stand up, stay focused and keep moving forward to get the job done. He is amazing and has awoken the pride of Calgarians everywhere! Yesterday, when the call came into our offices at the Homeless Foundation for volunteers to help in the beginning of the clean-up of the Calgary Drop-In’s (DI) Riverside Avenue facility, staff leapt at the opportunity to get into action. Rubber boots were donned, hammers hefted and off they trooped to dig in. It was not pretty. There has been no electricity in that quadrant of the city for several days. The evacuation order came in the middle of breakfast Friday morning. Food was left on tables, in the kitchen, on counter tops. Fridges, freezers, sinks were left as is. The volunteers dug in and cleaned it all out. My hats off to everyone, especially to the DI staff. They have been tireless in their response to the needs of the people they serve, the community and now, to getting the building back into shape for clients to move back in as quickly as possible. So many stories to tell, so many gestures of humanity to share. There’s my very own C.C. I told him the story of a mother whose heart was broken because her piano was destroyed and who cried because her children and she loved to make music together, and now what would they do? C.C. and his son T.C. who was hoping one day to move that piano into his own place because that’s the instrument he learned to play on, leapt at the opportunity to give her ours. It was the right thing to do they said. You guys rock! I found this video on FB last night and share it here. Thank you Calgary. You make me proud to call myself Calgarian. You remind me, we are all one, connected through our human condition — where ever we are. I am struggling and I am not alone. Those words drifted through my mind yesterday as I sat in a chair listening to my friend Kerry Parsons talk about her experiences at the Alia Institute last week in Halifax. Far from the raging waters of the Bow and Elbow, Kerry and many others were immersed in conversations and exploration of ‘authentic leadership’. And as she spoke the thoughts of the disaster rattled through my mind. “Why I sitting here doing nothing? I’ve got to get busy. I’ve got to pitch in”. It is true. I am struggling. As is every Calgarian and all of our neighbours in southern Alberta. The damage, says BMO Nesbitt is somewhere between $3 and $5 billion. Hello? that’s a spread of $2 billion unknown damage. High or low side of their estimates though, it’s a whole lot of damage. And we are struggling. Struggling to make sense of what happened. Struggling to know what to do next. Struggling to keep ourselves, and our families together. Struggling to get it done now when all we can do is stand in the ‘creative tension’ of our undoing by the raging flood waters. We are one community, together, moving forward, through, over and under, around and between everything in our path. My daughter and mother are still evacuated as are tens of thousands of others. But, good news, over 35,000 people have been able to return home. And when they have, they have been met by a phalanx of volunteers standing ready to pitch in, lend a hand, get to work. Take the Children’s Cottage. Its Bridgeland shelter was evacuated on Thursday night. On Sunday, Executive Director, Patty Kilgallon was allowed in to survey the damage on Sunday afternoon. When she arrived, she was met by JL Construction and 40 family, friends and strangers who pitched in to pump the place out, tear out dry-wall, carry out garbage and soaked furniture to get the place ready to receive the children home this week. In tears she told a news reporter of how incredibly empowering it was to have so much unexpected and welcome help. When JL Construction (I hope I have their name right — I heard her interviewed on the radio while driving to my office yesterday and didn’t write it down), anyway, when they were finished pumping out the Children’s Cottage basement, they continued on down the entire street pumping out every single basement. That’s the Calgary spirit. We are not alone. At Neighbourlink, food trucks have been arriving to serve up delicious food — for free. This is happening all over the city. The food truck phenomena spreads far and wide, the hosts of the trucks handing out free food to volunteers — and then, a stranger will walk up and pay for all the food. It is phenomenal. Also at Neighbourlink yesterday, a company from Red Deer sent down a semi-trailer full of donations. And, a call out for an empty semi to store all the donations their team and volunteers are processing resulted in 20 minutes later, Suncor Energy jumping in with a donation of a truck, complete with delivery and team of volunteers. My daughter’s workplace team headed out to Bowness in the morning, pitched in all day cleaning up mess there and then, when she called me at 5:00 she was on her way to Roxborough to help out a friend’s family who needed all hands on deck to salvage their home from the wreckage. When she arrived home at 9 she was exhausted but happy. And in all the activity her own concerns about when will she be able to go back home were forgotten. But it is stressful for her, and my mother and the 600 other seniors who still cannot return home to their Bridgeland apartments. I am tired and I am not alone. I am weary and I am not alone. I am grateful and I am not alone. I am inspired and I am not alone. I am doing my best and I am not alone. There are still those in emergency evacuation shelters. They are scared and they are not alone. And there are those returning home. They are worried and they are not alone. It is not until they walk into their neighbourhoods that they see what awaits them. It is not until they step through the door that they can see the mess. For some, the devastation is beyond repair. For many, there is much work to be done. For some, there is nothing to be done other than to check for damage in dark corners of their basements. For some, there is nothing to do but start again. All over. And in the starting again, they are not alone. It reassures me this thought. I am not alone. It gives me comfort. Solace. We are human beings and our DNA is programmed for connection, for belonging, for community. We may be struggling, but in our struggle we are not alone. Thank you to everyone who has emailed, text, called. I appreciate your thoughts and words and support and warm caring. You remind me, I am not alone. And thank you Kerry and Sheryl — the time spent conversing, sharing, inspiring one another gave me great peace. You reminded me, I am not alone. 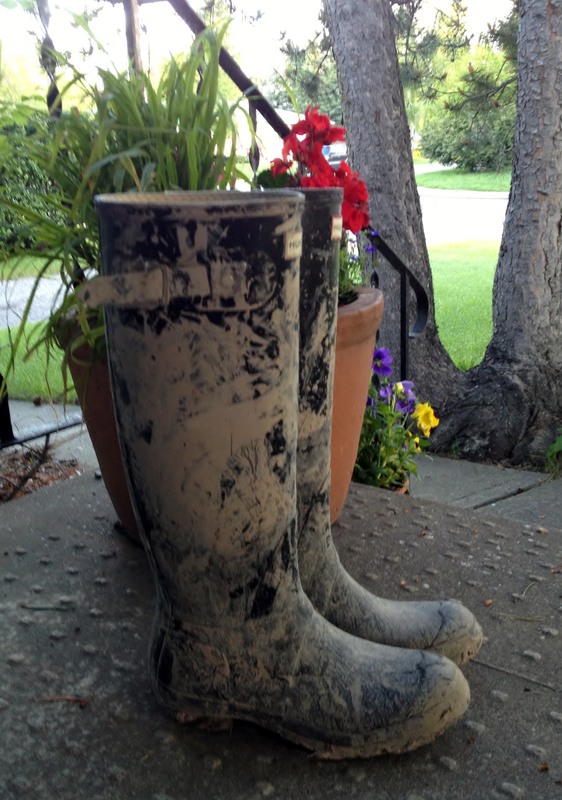 Categories: Uncategorized | Tags: Calgary flood 2013, cleaning up, making a difference, pitching in, Volunteers | Permalink. The waters recede. Our spirits remain high. We begin. The flood waters have receded and in their departure the city begins to survey the damage. It is extensive. It is heart-breaking. It is stunning. But it is not the end. My City is a city of spirit. Of strong people. Of people willing and able to withstand even Mother Nature’s fury with a smile, a Howdy, how can I help? Let’s get to work kind of attitude. And that’s what’s happening today. The work begins. My daughter received an email from her boss at Shaw Communications. The communications team are mustering via phone at 8 and then, off to help out in the community. My team at the Calgary Homeless Foundation are meeting at 9 and then, going to where ever we are needed. And the same story continues throughout places of employment. Mother Nature may have been alone in creating this devastation, but we are not alone in our recovery. We are all connected. We are all together. We are all one community. Over the weekend the man who stands out for his amazing grace, spirit and capacity to be everywhere at once letting people know they are not alone is our Mayor Naheed Nenshi. Thank you Mayor Nenshi. You have inspired an entire city, province and country with your unflagging support, your focus on ‘people first’, and your calm delivery of facts and information. Your team has handled this emergency with incredible professionalism and done a stellar job of keeping all of us informed and calm. Thank you. There are so many people who have done so much over the past 4 days — seriously? has it only been 4 days? — and their willingness to put people first, to do whatever it takes to make sure people are safe is incredible. Police. Fire. Bylaw. Alberta Health Services. Calgary Emergency Response Services. Red Cross. The list is extensive. While volunteering at one of the evacuation centres, I was in awe of everyone’s capacity to simply help. To lend a hand, ear, voice to people in such enormous emotional distress. They kept everyone calm with their compassionate response. and, as always happens in this city, the Calgary Stampede Volunteers make an enormous difference. I worked with women and men who have never dealt with people in this position before and who made it look like second nature. There was Shirley who, faced with a distressed man who kept insisting he could not sleep in a room with others, gently and caringly talked to him for 2 hours to calm him down. There was my brother-in-law Jim who could not put stop helping out at the Evac Centre down the road from their house. There was Suzanne who, when trying to find a space for a woman who mobility issues, a wheelchair that needed plugging in and many health needs, simply sat quietly with the woman creating a plan to ensure the woman felt safe and well-cared for. And there are countless other such incidents. Like my daughter and her fellow evacuee Laura who, along with a group of her friends volunteered all afternoon at the Calgary Drop-In’s emergency shelter location at Greenview (the downtown building was in the path of the floods and everyone was evacuated Friday morning) sorting donations and lending a hand where ever needed — like so many others. There’s the team of the DI (the shelter where I used to work and where my heart still belongs). Mark. Natalie. Jorge. Jane. Dana. Michael. Bruno. Paul. and so many others — you still inspire me. thank you for all you are doing to ensure no one gets lost on our streets. There’s Kathy Christiansen at Alpha House whose shelter was evacuated on Thursday afternoon and who all weekend, along with her staff, kept turning up at the Evac centres to ensure their clients were safe. Their DOAP team van was out in every quadrant of the city helping where ever possible to ensure the safety of everyone. As the waters flowed in around her knees on Thursday afternoon, Kathy and some staff, with police assistance, entered the building to retrieve important documents and to ensure their servers were safe, so that her team could keep working no matter what. Their shelter was hit hard. There’s Phoenix from CHF who knocked on every door of our building in Bowness, along with Andrea from CUPS to ensure all tenants were safe and who then, throughout the weekend kept checking on those who refused to leave. So many stories of greatness. So many acts of bravery. Of selflessness. Of humility. This is a great city. We are a spirited people and we will get through this. So take that Mother Nature. Thank you for shining brightly today. We appreciate the sun. But know this. We, the people of Calgary will continue to shine through rain, flood and now into the aftermath. You can beat us up Mother Nature, but you can’t beat us down. and to all our neighbours who have been decimated by these floods — our hearts and prayers are with you too. We are not just one city. We are one province and we will always be one community. And now, gotta run. There’s mopping up to be done. Flood waters to clear out and work to be accomplished. Calling volunteers (and their smiles) to help welcome residents back to their homes on June 24 starting at 10 a.m. The City is looking for volunteers (18 years or older) to knock on residential homes to help welcome their fellow Calgarians back into neighbourhoods, providing information on flood recovery and other community resources will help residents transition back into their homes. Please meet at McMahon Stadium at 10 a.m.on June 24. Volunteers should bring appropriate footwear, bug spray, weather appropriate clothing, sunscreen, cell phone, water and snacks. Once at McMahon Stadium volunteers will be asked to fill out a volunteer form. Volunteers will then be bussed to different sites around the city and back to McMahon at the end of the day. The day will go from approximately 10 a.m. to 2 p.m. Thank you and please stay tuned for future volunteer opportunities. thank you my fellow Calgarians. We are the vulnerable. We are the one’s with little resilience, little built-in resources to defend against life’s unexpected turns. We are needy. Needy of help. Support. Understanding. Needy of someone to listen to our stories. To hear our voices. To hear our painful calling out to be seen, witnessed, heard. We are not needy in the negative, ‘he’s so needy’ kind of way. We are needy because our needs have never been met. Never been acknowledged. Never been fulfilled. We are needy because we have never known ease. Never had an answer that would stop the constant outflow of our resilience, of our capacity to help ourselves reach up to higher ground where we can shed the stale, awful smell of where we came from nothing but the clothes upon our backs and the promise of something more. We are needy of a better way, another path, another direction to find ourselves somewhere walking away from where we have always been on the bottom of our society’s need to keep us in our place to a place where we know, life is good, even when we sit and simply soak in the sunshine warming our faces. These thoughts floated through my head this weekend as I struggled to push back my own feelings of helplessness, confusion, weariness arising from the devastating impact of the floods my city has experienced over the past three days. I write the words and they stun me. Has it only been three days? How can so much change in just 72 hours? Where once, bridges spanned creeks, raging waters flow beneath their concrete girders that have been battered with the forces of natures fury hurling its might against them. Where once expanses of lawn and wildflower strewn fields lead to the calm waters of a river quietly flowing towards Hudson’s Bay, torrents of water race to obliterate all presence of land, all memory of calm. Where once, a roadway linked two sides of a street, two solitudes lie separated by a body of water never before seen, deep and impassable, no one knows what lies beneath its murky surface until the waters recede. We wait for the rain to stop. We wait for the winds to quit howling. We wait for the waters to recede, the rivers to quit flowing, the streets to empty. We wait for the sunshine to stay, the winds to stop, the confusion to subside. And in its stead we are left with the devastation. We are left with the trees uprooted, the homes flooded, the lives redirected. We are left with uncertainty. With relief our homes our safe and sadness for the one’s who have lost so much. We are left feeling guilty for our relief, and relieved we are still able to help out those who have lost so much. We are left with joy no one was hurt and sorrow for those who have been impacted by nature’s fury. We are left of the storm but never of our optimism, our compassion, our belief in the power of each of us, individually and collectively, to make a difference, to change the course of time, to redirect what has happened into a new way of being, neighbours, friends, compatriots, companions, each other’s support. Two rivers overflowed their banks and my family, friends and neighbours have been affected. But no matter how furiously Mother Nature may unleash her best, or worst, there is one thing she cannot change. Our spirit. We have been beaten up, but never will she beat us down. We are Calgarians and we are proud, we are fierce and we are committed to work together, to help one another and to leave no one behind. Thank you my friends and fellow Calgarians. Thank you for showing me every moment of these past three days what it means to be one community, one spirit, one people committed to standing together to make a difference. The waters will recede. But nothing can dim our spirit. It is the second time I have started to post today. This morning, I never got to my computer. The news in my city too grave, too shocking, too stunning to give my heart room to post. Yesterday evening, my daughter and her cat, along with her room-mate arrived at my house seeking refuge. Their apartment building along the beltline of the downtown core had been evacuated. The flood waters were quickly approaching. They needed shelter. I glued myself to the TV. Watching breathlessly as report after report rolled in of more evacuations. Neighbourhood after neighbourhood. Families. Singles. Elderly. Homeless. In total, 100,000 people forced to flee for higher ground. I spoke to my sister. Our mother lives in a senior’s residence close to the Bow River, one of the two rivers that runs through Calgary. Situated on a flood plain, it was on the ‘evacuation watch’ list. We waited. No news. Perhaps they’ll be saved we said. We crossed our fingers, toes, eyes. Said a prayer. Said many. And waited. At midnight I finally tore myself from the television and went to bed. At 7:30 my sister called. The manager of our mother’s residence had just called. The buses had arrived at 1:30am to transport over 250 seniors from four area residences to an EVAC centre. My daughter, her room-mate and I headed out to make our way to the centre. It was a slow drive that ill-prepared us for what greeted us when we arrived. It had taken until 5am for the buses to arrive at the centre. Bridge closures. Road closures. Detours. Secondary routes had caused delay after delay of their passage across the city. What should have been a maximum 40 minute drive (more likely 20 minutes at that time of the morning) had taken 4 hours. And take care of them they did. With precision and grace and efficiency and most importantly kindness and compassion. Chairs were set out. Food. Blankets. A medical centre established. Names were registered. Volunteers turned up. Donations started pouring in. And so did people. Women from an emergency shelter. Seniors. People from down the valley along the river who had no where else to go. By the time we were able to make it there, people had been sitting in chairs for hours. And still, they smiled. They laughed. They shared a joke. A hug. A kind word. One man sang. In his seventies, he danced with my daughter’s room-mate, his voice a shaky but rich baritone. Another man clapped his hands in time. We handed out fruit, yoghurt, coffee. We sat and chatted. We found blankets. The cellphone became the connection that shaped each person’s next destination. I phoned my sister. Liseanne, my daughter, would drive our mother to her house in the deep south of the city. We shared concern — would she be able to get across the causeway that spanned the reservoir? It’s open now, I told her. And then, I asked if another woman could come. Her son was somewhere working for the City. Shoring up berms. Filling sandbags. He’d come later to get his mother. My sister quickly said yes. Of course. And Liseanne set out with her two precious passengers while Laura and I continued to offer whatever support we could amongst others doing the same. We came home late afternoon. I tried to post but my mind was too full. My heart too heavy. She was confused. Disoriented. She’d pulled on her beautiful red wool winter coat, grabbed a pair of black leather sandals, her handbag and left still wearing her pajamas and pink bedroom slippers. Her neighbour from the apartment below hers had joined her in the cab. She had taken the time to pack her valuables into a large suitcase. Both sat together talking, sitting silently, wondering if they’d be allowed to go home that night. “It will be a couple of days, at least,” I told them. In a time of crisis there are so few answers. There is only the best we can do to create safety. Comfort. Ease. I finally reached the woman in the red coat’s niece. After much struggle to get to the centre, she arrived, hugged her aunt and lead her out to her waiting vehicle and a safe place to call home. The woman with the carrots son-in-law arrived and she too has found rest with her family. My sister’s guest will stay the night. Her son is stranded on the north side of the river, his home also evacuated. But still, he works tirelessly to do whatever it takes to help out in this crisis. Like so many city employees, first line responders, EMS, health employees, Red Cross workers and volunteers, they are doing whatever they can to make a difference. And the rain falls and the waters keep rising. People like Shannon. A nurse who arrived because, as she said, “I couldn’t stay home and do nothing. My husband can take care of the children. But I can help here.” She phoned her husband to tell him to make up the spare room. “Who knows who I’ll be bringing home,” she said. Our city is under seige, as are many communities to the west and south, but the spirit of our people shines bright. Eventually, the rains will stop, the waters will recede but nothing can dim our spirit.